We had nothing much to worry about, and it hurt. It was the New Millennium, and we listened to Jimmy Eat World. We were devastatingly good kids. Sure, there were basement parties and sneaked-in booze and boys. There were fences scaled and scuffles under streetlamps that left no bruises. When we were bored enough, we kicked around the darker corners of our floodlit suburbs and slept in backseats or the woods until it was day enough to go home. But everybody went home. We graduated, we kissed our mothers. Our eyes stayed wide, and we stayed in touch. 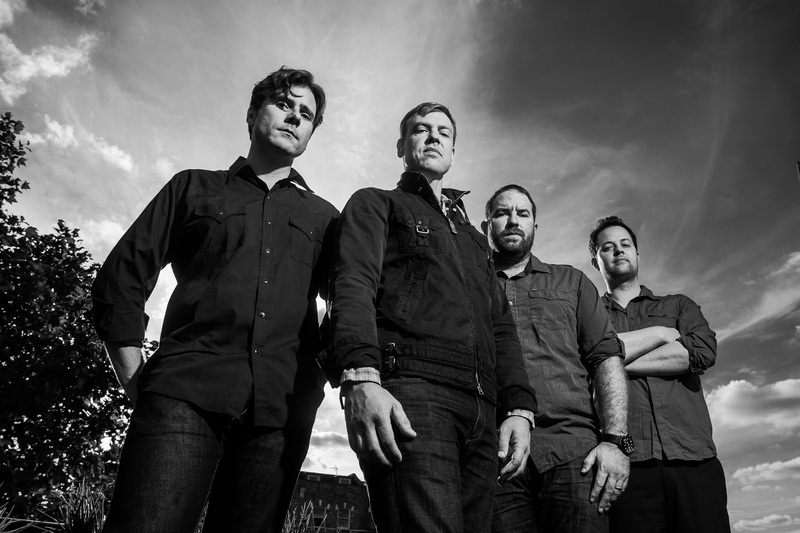 It's been fourteen years since Jimmy Eat World's third album, Clarity, ushered in the third wave of emo, (a.k.a. when emo finally got up the nerve to ask power-pop to the alt-prom). It's been fourteen years, but last Saturday night, Indianapolis's Egyptian Room nearly filled with these earnest middle-class kids all—or almost—grown up. We spent our adolescence poking fun at how our late-Boomer parents' classic rock stations couldn't let go, but how does nostalgia function in the aging music of Millennials? Over a long set that delivered its hits while sampling from new album Damage, Jimmy Eat World asserted that they make adult breakup music for angsty, if well-adjusted, youths....or maybe, vice versa? Frontman Jim Adkins led the four-piece (same line-up for seven of their eight albums) through four songs from the last three albums before reaching back to Clarity for “Your New Aesthetic.” While Adkins' still-boyish floppy hair and invocation to “Take back the radio!” fell a bit flat, the chorus of next song “Lucky Denver Mint”—“You're not bigger than this, not better, why can't you learn?”—is a sweetly-pleading evisceration that stings whether you're seventeen or thirty-seven. It was a well-built show: they mixed new and old material seamlessly, and the pace never lagged before ramping up to close the regular set with a one-two-three knockout of hits from 2001's breakthrough Bleed American. The band sounded studio-produced-tight, and they managed to make space for a couple of unabashedly moody numbers, which were the most emo-moments of the night: “23” and “Hear You Me”—a plodding acoustic shimmer addressed to deceased loved ones. Think “Fire and Rain” without the specificity of that loss. Jimmy Eat World has always written with concerns big and broad. They did not break into the mainstream by writing whiny pop-punk or by riding a glossy cult-of-personality. Their shows have never dissolved into a kum-ba-ya crowd cry-along. They have written two forceful political singles—“Bleed American” and “Futures”—and have dealt in direct, if lyrically vague, terms with drug use, adultery, suicide, and death. However, in 2013, the predominant takeaway of their oeuvre is an appeal of preemptive nostalgia to sensitive sensibilities (like mine): Take note of this moment, guys, because it's already slipping from your hands. This generalizing quality seems to stem from the anthemic sound—simple, echoing drums, a slightly retro swing, insistent groundwork strumming (the guitar equivalent of a pen on looseleaf scribbling out the name you thought would love you forever), a breakdown to better hear the soaring platitudinal lyric—“Everything, everything will be all right, all right!”—or “Whoa-oh, oh-oh-oh-oh!”—all of which has hardly changed a beat since the early-Aught's. Should their fans demand more growth of Jimmy Eat World's sound or scope? Sure, if the band's new releases hope to achieve the same status within its listenership's personal pantheons. Currently, they represent neither the future nor the present, but do exemplify a formative moment in recent music history. The band continues to put out records that are very good if not revolutionary, and they put on shows with competency and heart. And anything less than a bloody, hand-drawn heart has no place at a Jimmy Eat World show. I attended this show with one of my oldest, closest friends and her new partner (—albeit “new” is a relative term when you've known someone since they were a squirrel-headed twelve-year-old). The two sang and swayed together, both of them, I imagine, breathless at the idea of the other at fifteen, parallel hearts breaking and bursting separately but simultaneously, soundtracked by Jimmy Eat World. In this band, they share individual memories and somehow share more of each other. So maybe that's the function of this nostalgia, no matter the music or generation: We're still good kids who try to go home, though home may be lost to the distance of time (Are you listening?). We stay in touch (Sing it back). It's an ache, after all, but it's a sweet one.